Air Fryer Apple Cinnamon Dessert Empanadas (Hand Pies) is a quick and easy low-fat recipe that makes the perfect treat for any occasion. Even the kids will love them! Less than 20 minutes of cook time! Back at it again with the Air Fryer. I have made empanadas a couple of times before. 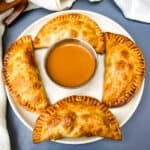 Be sure to check out my Beef and Cheese Empanadas and Shrimp Red Pepper Cream Cheese Empanadas recipes. I love these recipes but wanted to test out an Air Fryer version….and this time DESSERT! 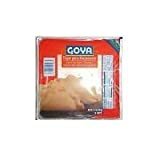 Goya Tapa Empanada Dough Shell, 11.6 Ounce - 16 per case. This is the brand I used. My other empanadas recipes are baked, so they are also low in fat. I will say the Air Fryer did not yield different results than baking. Both methods result in crispy and crunchy empanadas. The cooking time is similar in both instances. So if you do not own an Air Fryer feel free to bake these on 425 degrees for 20 minutes. Air Fryer Apple Cinnamon Dessert Empanadas is a quick and easy low-fat recipe that makes the perfect treat for any occasion. Less than 20 minutes cook time! Place a saucepan on medium-high heat. Add the apples, cinnamon, nutmeg, honey, and vanilla. Stir and cook for 2-3 minutes until the apples are soft. Mix the cornstarch and water in a small bowl. Add to the pan and stir. Cook for 30 seconds. Lay the empanada wrappers on a flat surface. Add the apple mixture to each. Close the empanadas. Roll the empanada in half. Pinch the crust along each of the edges. Roll each of the sides inward. Continue to twist the crust until closed. Add the empanadas to the Air Fryer basket. It's ok to stack the empanadas. Place the Air Fryer on 400 degrees. Cook for 8 minutes. Turn and flip the empanadas. Cook for an additional 10 minutes. This recipe was prepared to be a lightened-up and more healthy version of dessert. If you wish to have really sweet empanada hand pies, add your desired amount of sugar to the recipe and additional honey. Taste your mixture repeatedly until you obtain desired taste. Instead of rolling the empanada edges you can close them by making vertical imprints with a fork along the edges. Oh, those look so delicious! I’ve never used an air fryer but also would never have thought you could make something like these in one. I love apple cinnamon, and must try these! Anything cooked with apples has my full attention and these sound and look yummy. I have yet to taste any Air Fryer food but I am interested. My friend cooked her turkey in an Air Fryer last Thanksgiving and gave it rave reviews. I definitely need to buy one and get on board. Your posts are making it hard to stay on Keto!! These empanadas look amazing. I want them right now! This looks like such a yummy dessert. I can’t wait to make these apple cinnamon empanadas, thanks for the recipe. Oh wow… honey, vanilla, cinnamon, nutmeg…. ahh it just sounds so so so good for fall. I want these with a warm cup of coffee. Having the dough premade saves a lot of time and mess. This dessert looks really good. I love apple desserts, so i have to give this one a try. I love empenadas! And now I have another reason to get an air fryer. These look delicious! I think my kids would live them and I love that they provide a good balance of healthy fruits to the deliciousness of the crust. Yum!! I love empanadas. We make them all the time and those looks amazing!! I love empanadas — never had them for dessert. I can’t wait to try these soon! I make empanadas all the time but normally there filled with your typical chicken or beef. This is unique and perfect for fall!! Oh yum! I love apple cinnamon desserts so I’m sure this tastes delicious. I will have to try this recipe for sure. Thanks for sharing! I can’t wait to make these, I’m always looking for new recipes to make in my air fryer. Apple and cinnamon is one of my favorite Autumn flavor combinations. This is perfect for my afternoon coffee! I still have to try an air fryer, but I am amazed at how versatile they are! I have an air fryer and I love it! They come us crispy and yummy. I haven’t tried something like this before, but I think I will this weekend. I don’t own one, but I’m fascinated with air fryers. People seem to love them. I’ve even heard the term life-changing. Thanks for sharing this deliciousness! I don’t have an air fryer but I do have a normal fryer. These look good and are so perfect for fall! I want to try making them. These look so good! I’m dying to get an air fryer! These look amazing and like they were fried! I keep hearing about air frying and think it’s about time I give this a try. I bet these would be wonderful with tea or coffee, and fresh out of the air fryer! One of my favorites. I hope you enjoy it. Would love to try the empanada recipe but where do you get empanada wrappers? I live in southern California. I purchased mine at a local Latin grocer. I also have a link at the top of the post for Amazon purchases. How can you go wrong with apples and cinnamon? Yum. And as a plus, I”ve learned how to fold a perfect circle lengthwise. Genius! Thanks so much for sharing a great recipe. Empanada on! I couldn’t find Emanades wraps but I used Wonton wrappers and Auf Dryed them for 7 minutes at 400 degrees. Everyone loved them.